Although a lack of adequate sunlight can be an issue for many plants in the landscape, there are plenty of shade loving perennials that can flourish without having direct sunlight. In fact, many actually thrive in the shade! All too often, folks struggle with trying to bring color and texture to the the less-sunny areas of their landscape. Shady areas can certainly be difficult to get many common plant varieties established. Or for that matter, to even to get grass to grow. Astilbe is a great choice for the shady areas of your landscape. These locations of the yard usually end up as either a muddy mess. Or, a large plot of mulch that can be a nightmare to maintain. But don’t despair! We have you covered today with some great shade loving perennials to the rescue. Not only is it a better option than mulch, it is great for the birds and bees. Astilbe plants produce colorful plumes of flowers that shoot into the air. Their dark and glossy fern-like foliage is a great contrast to the blooms. Although large, the gorgeous flowers do not require staking as they grow on stiff stems. And as a bonus, the blooms hold their color for months! They are versatile in size ranging from tiny dwarfs to large, oversized hybrids. Liriope is a wonderful choice for both shade and semi-shady areas. It is extremely shade tolerant. It also makes an excellent ground cover or border plant. Liriope forms small clumps that grow 6 to 12″ high. It spreads slowly to fill areas and is extremely hardy. It grows in much the same way as an ornamental grass. In the fall. lirope flowers with spiked shoots of blue or white, depending on the variety. 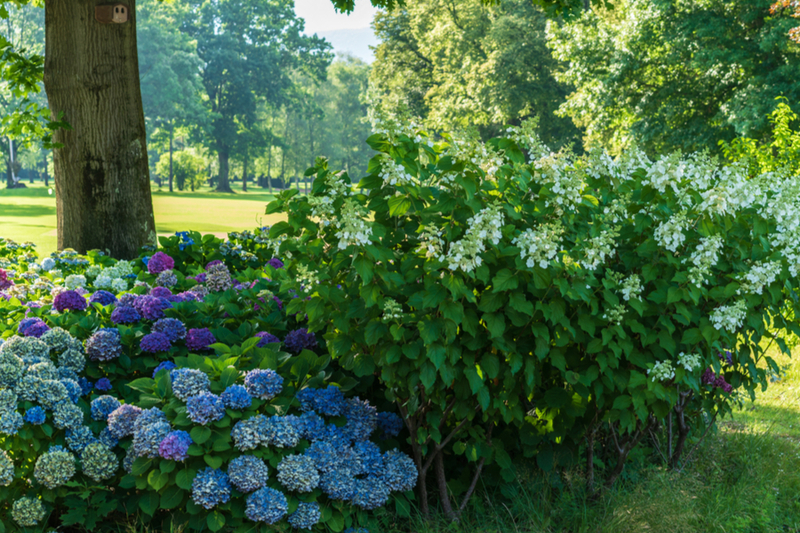 Oakleaf Hydrangeas have big, thick flowers that form in clusters, The Oakleaf is actually a shrub, and provides year-round interest to the landscape. Most Hydrangeas can handle a touch of sun. Morning sun is the most gentle and will not disturb their growth or blooming habits. Coral Bells, also known as alum root, are another terrific option when looking for shade loving perennial. Their unique and dramatic foliage provide a variety of colors to spruce up shady beds. The low-growing leaves can range from green to dark purple in color. Coral Bells’ foliage can also be found with in types of variegation. This is the perfect choice to use as a ground cover. Coral Bells produce delicate flower spikes on wiry stems above. They are that are long-lasting and beautiful to look at but won’t obscure the plants behind them. The Hosta is the king of the road when it comes to shade loving plants. In fact, most varieties thrive in low sunlight. Hostas come in all shades of beautiful greens, blues, and even whites. And many varieties are variegated, adding even more interest to their leafy foliage. Their lush leaf structure can spread out over a large area, making them a perfect choice for planting under shade trees or close to the house. One word of caution when it comes to hosta, deer love them! They are certainly not the best choice if Bambi and her friends frequent your yard. They can also be divided and transplanted easily in the early spring to help fill large areas while not breaking the bank! So if you have a few shady areas of your yard that have been neglected, how about trying some great shade-loving perennials to add a little color and interest.